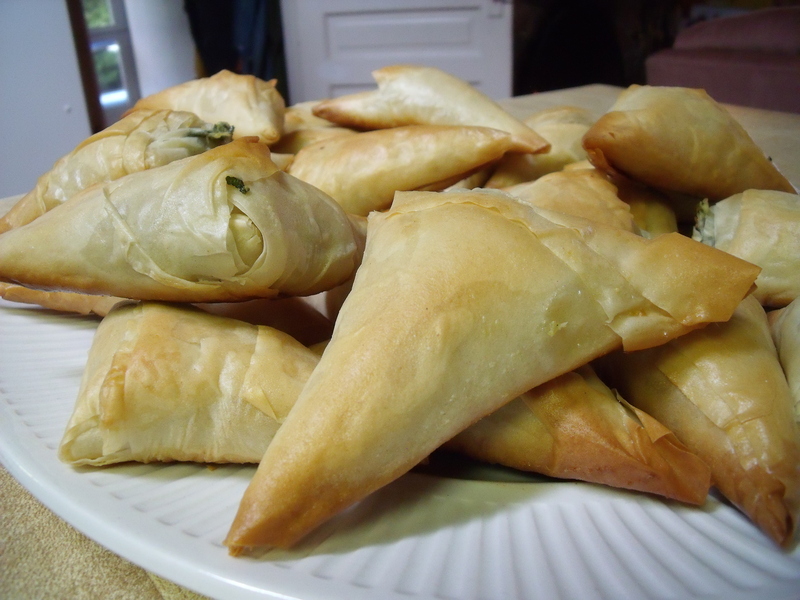 Now my spanakopita aren’t necessarily authentic. 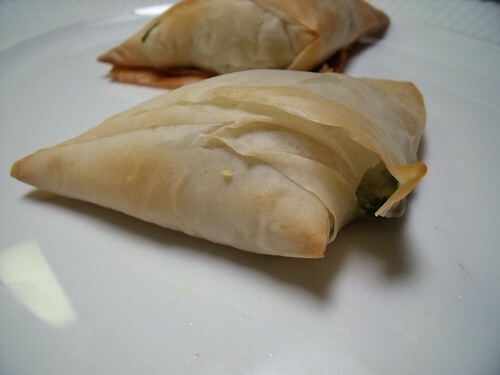 So we can maybe call them Spicy Spinach and Goat Cheese Phyllo Triangles, but it’s easier to say spanakopita. I’ve added just a little bit of zip (chili flakes or cayenne powder) and I love them this way. I also used goat’s cheese instead of the traditional feta cheese because that’s what I had. 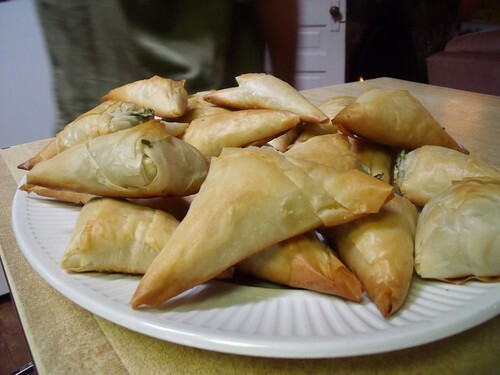 But if you want to make them more traditional, you can leave out the spicy, and use feta instead. So I had to try them out too! 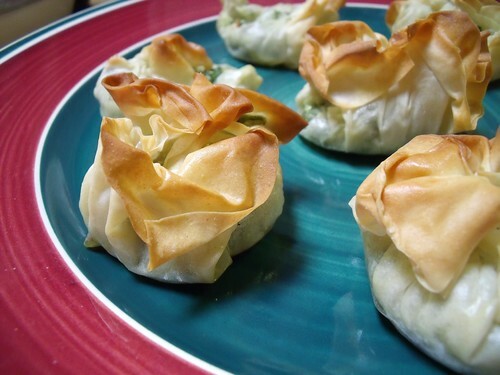 So now you have two ideas for fancy looking appetizers that are definitely easy to make but look supremely impressive and taste divine. You’re welcome! In a large bowl, mix together spinach, goat’s cheese, garlic, chili flakes, sea salt, and olive oil. 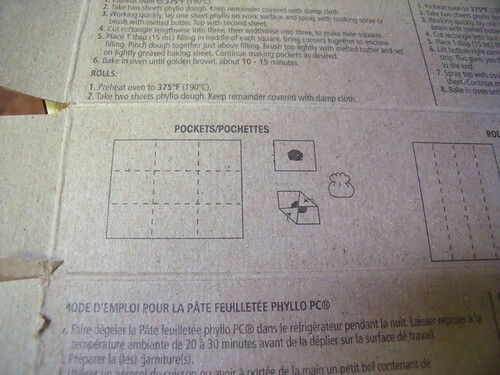 Open the package of phyllo, and spread out the phyllo near where you will be shaping the phyllo. 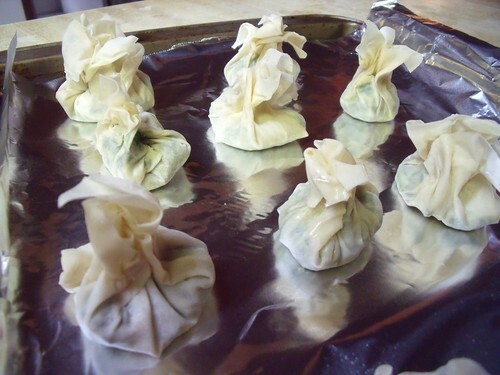 Wet a clean tea towel and ring out the excess water so it is damp. 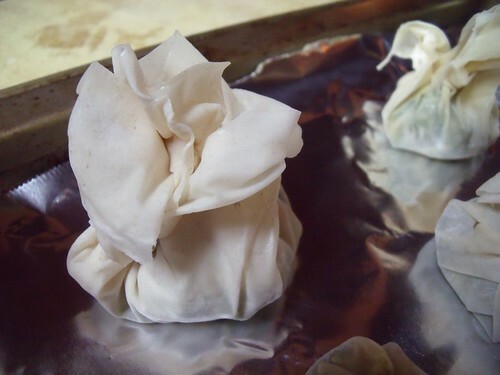 Take out one sheet of the phyllo and place it vertically (tall not wide) on your work surface, and cover the rest of the phyllo with the damp tea towel. 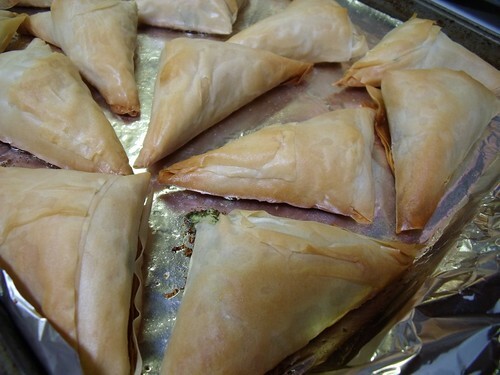 Using a pastry brush, brush the sheet of phyllo with melted butter. 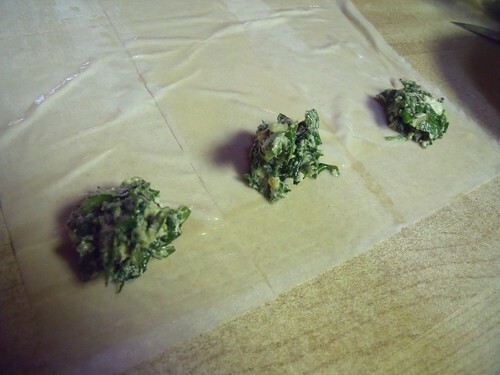 Lay a second sheet of phyllo on top, and brush with more butter. 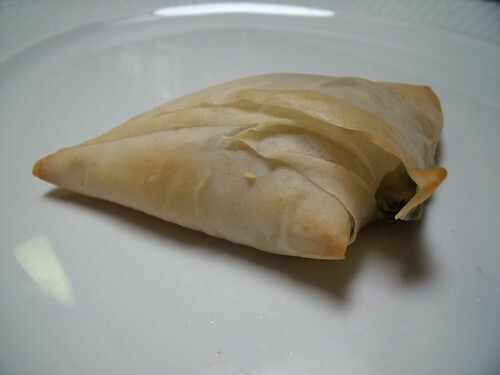 Slice the phyllo into 4 long strips, and place a teaspoon of filling in the bottom centre of each strip. 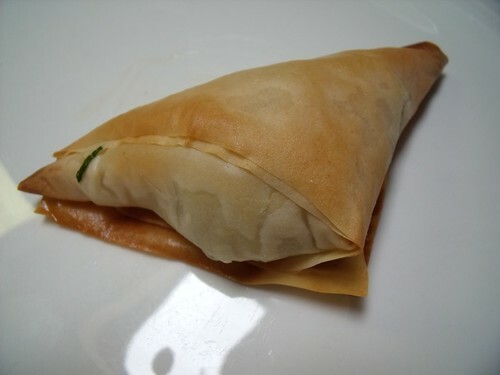 Fold the bottom edge over the filling to form a triangle. 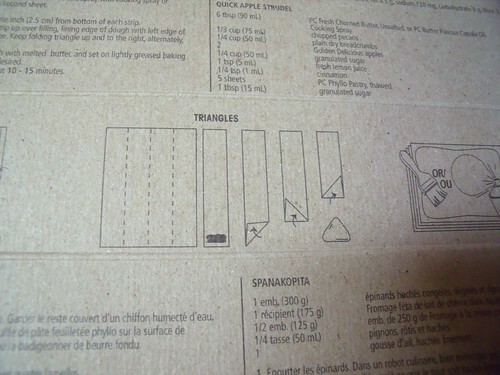 Continue folding up triangle after triangle, until you have run out of the pastry strip. 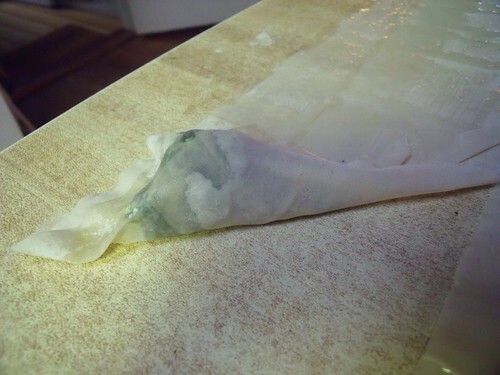 Place your finished triangle on a foil-lined baking sheet and lightly brush the top with melted butter. 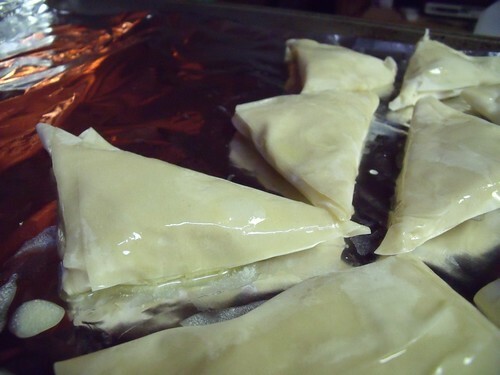 Form triangles with the rest of the phyllo dough and filling. 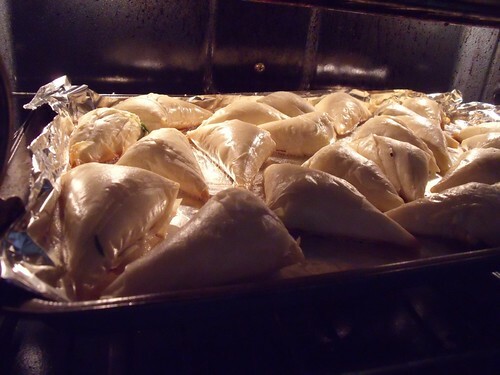 Bake at 375F for 20 minutes, until the triangles are golden brown. 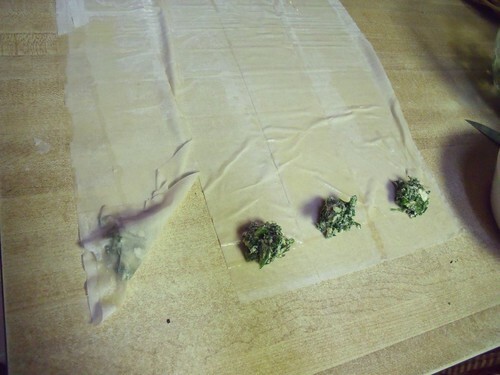 Remove from the oven and let cool for 5 minutes before moving to a serving platter.